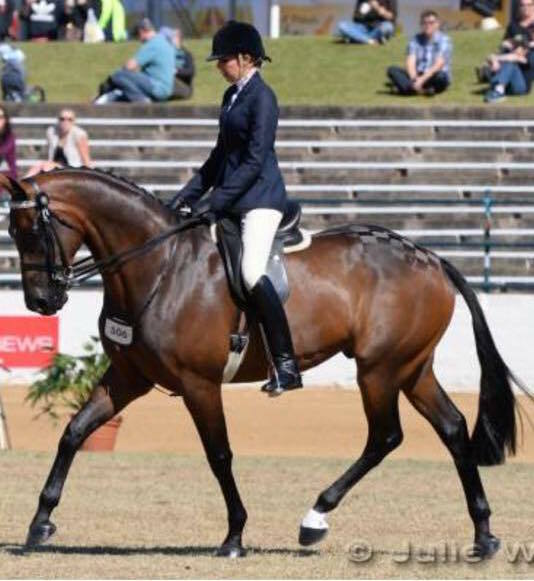 We interviewed breeder Dom Knight about the first horse she ever bred, Kitara Top Contenda. Why did you decide to breed your own horse? I was sick of purchasing ‘other peoples problems’ – I wanted to breed a flash young horse that I could train myself, the way I believed a horse should go. No, this was our first born ‘child’. Tell us more about the mare you chose to breed from. The mares name was Kitara Topsy, a TB mare by Dreamtime of Wondaree – I purchased her as a 2** eventer with every intention to compete her, but she was very accident prone and when she ran through a fence and was going to have 6+ months off I decided to put her in foal in the meantime. She never returned to be a riding horse as she proved to be a super producer and kept injuring herself! She unfortunately passed away just days after she had her 3rd foal. You bred to Contenda the first season he was at stud when he was just a newly imported 3 year old colt. What was it that made you choose to breed your mare to the then unproven Contenda? I first saw Contenda in the flesh whilst at Revelwood Stud and loved the look of him as well as his promising bloodlines.My mare was a big, tall and long mare but very athletic, so I wanted to choose a stallion who was a bit smaller and more compact than her. Contenda is also very uphill, which I believed complimented her slightly downhill type. He seemed a lovely young stallion with lots of presence. What were your first impressions of Piper as a foal? He was simply stunning! He looked very much like Contenda. Although plain bay, he has a very pretty head and was exactly what I hoped for – very well put together and a big mover. What have been your highlights with Piper? Definitely when he was awarded an ELITE foal and named a stallion prospect at the ACE tour by the German judge, Dr Gerd Kuest. He placed 5th in Australia against some fancy imported colts. I must also mention our first and only outing together as well – where we won the Dressage phase of his class at Camden ODE by 10 penalties. He was so well behaved and had some fantastic comments from the judges. What do you feel are Piper's best qualities? He has a bit of a quirky temperament, but under saddle he was just such a quick learner and has a fabulous easy way of going. Big trot, balanced canter and a soft mouth making him a pleasure to ride as a young horse. When piper was a 4 year old you decided to sell him. Why was this? I was very much an event rider at the time of breeding and training Piper, I had my eyes set on him being a top event horse. As it turned out, although he had a fantastic jump on him, he was a spooky horse and hated water! I thought he would be better suited to the dressage/show arena therefore, sadly, I decided to sell him. How do you feel seeing Piper all grown up and out competing with great success his new owner Renee Simpson? I am such a proud breeder! He looks amazing and is proving to be exactly what I thought he would be – a very successful show and dressage horse. 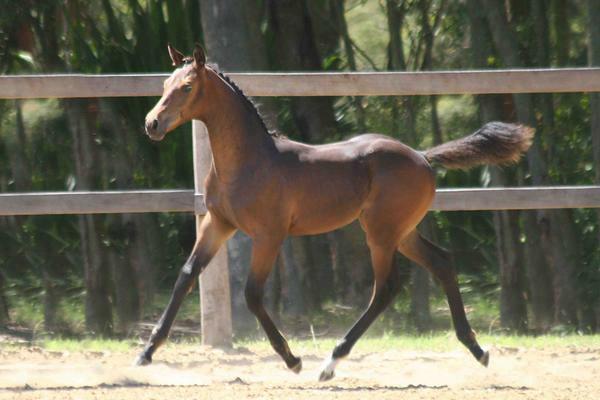 Renee is so well suited to him and always sending me photos and updates of our ‘eldest child’ bred at Kitara Lodge. Would you consider breeding to Contenda again and if so what type of mare would you choose? Yes, I believe now that Contenda has been out and about and shown his talents across all 3 Olympic disciplines. He has proven himself to be a very handy, modern sporthorse that stamps his progeny. I would probably choose a mare similar to Kitara Topsy as it seemed to work well. Something that was a good mover, easy going temperament and well bred. Kitara Topsy was a typical ‘hot’ TB and Contenda seemed to compliment that as well as Piper is far from a hot horse – Piper turned out to be the best of both Topsy and Contenda. Keep an eye out for the interview with Kitara Top Contenda's new owner Renee Simpson to find out more about their partnership in an upcoming edition of Progeny in Profile!